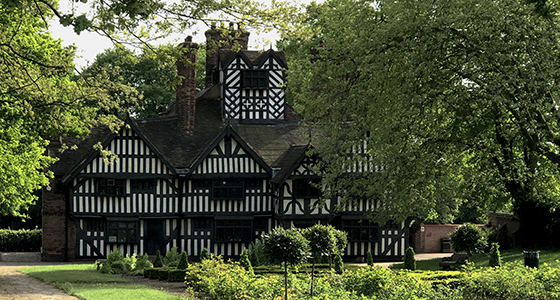 The Oak House was built in the early part of the 1600s and was known to belong to John Turton and his family, whose wealth came from farming, nail making and latterly, money lending to the gentry after the civil war. Whilst the house appears to be Tudor, it was extensively refurbished in the late 1800s by Alderman Rueban Farley. Farley was later to gift the house to the borough as a museum and it welcomed its first visitors in 1898. Our impromptu visit was rather fortuitous, we were the sole visitors that day and had the building to ourselves. Despite the house sitting in the middle of a built up residential and commercial area, when you enter and close the heavy door behind you, it is very easy to forget where you are; only the wail of a police siren brings you back to reality. There is a very amiable, lived in atmosphere to the house and you expect at any moment, a member of the family might turn around a corner. It most certainly doesn't feel like a museum, which is a very good thing. The recordings made at The Oak House were relatively brief in comparison to our planned investigations, however we captured a disproportionately larger amount of clear EVP. Pleasingly some of the recordings echo the history of the house. The clips below are featured in the video along with many more voices from the recordings. EVP 1: This clip was recorded as Rachel and Tracey moved from the kitchen to the dairy room next door. It sounds like a mans voice speaking but there were no men present on site at the time of recording. EVP 2: Again another male voice who calls Rachel's name before she asks to be told about the house's history. The intonation and character of the voice is quite unlike our voices. This was recorded in the entrance hall. EVP 3: Standing in a room that now houses period dressing up clothes and games, Rachel and Tracey could hear a noise coming from the garderobe (toilet). It is very hard to believe that EVP can be as clear as this capture but over the years we have many such examples. We would like to return to The Oak House having received such clear communication. EVP 4: Tracey reminded Rachel to take some pictures to document their visit. The recording features two voices that do not belong to us; the first is a woman and the second is a male, whose voice is very different to the first. This was recorded in the kitchen. EVP 5: Rachel is in the main bedroom when she remarks that she can hear a woman's voice and then to say that she is placing the recorders onto the mantle; three different voices are captured in addition. Historically the head of the household held office as a judge, hangings were known to take place on the site and a further clip on the video makes mention of a noose.